The area rugs of today aren't the area rugs you used to see at your grandma's house. Nope. Today the choices are wide ranging and absolutely unexpected. When we think of motivational and educational messages, we normally add them to a space by using prints or wall decals. 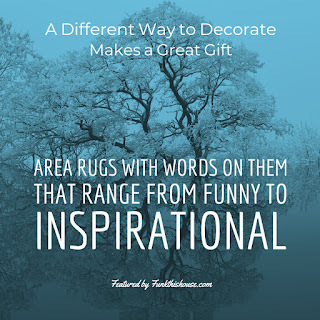 However, today you can find area rugs featuring inspiring words ranging from spiritual to comical. 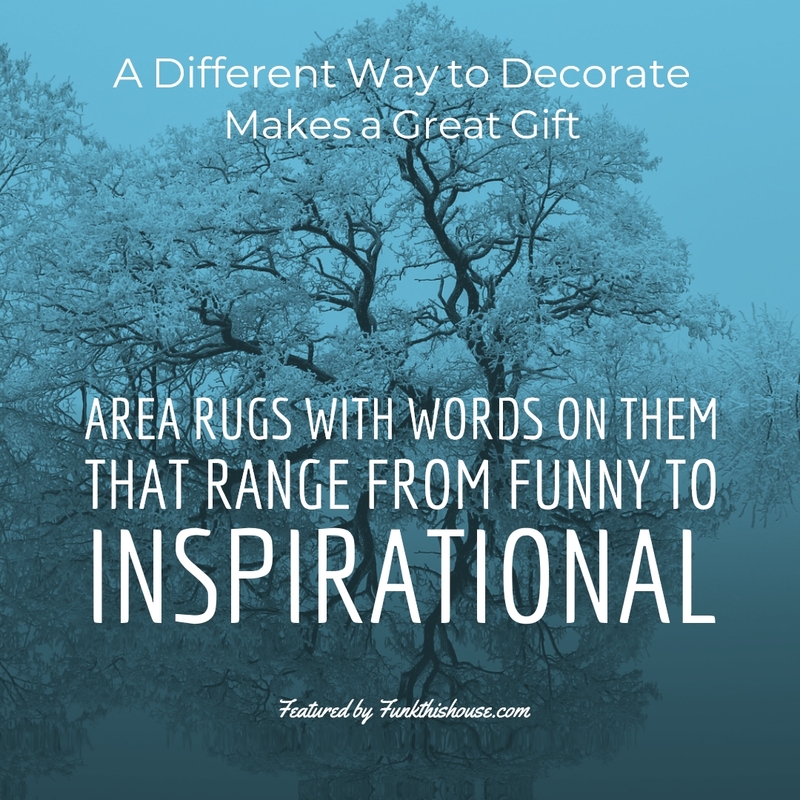 Choose an inspirational rug with words for a gift. There's a solid chance the recipient won't already have one. In fact, they've probably never seen one. Inspiration doesn't have to always be serious and tutorial in nature. It can also be light and fun and still deliver a profound message. Best of all, you're giving a practical gift that will actually be used to enhance the décor in a room. Find inspirational words featured on rugs that speak to the positive traits we should work towards. Feature a motivational rug in an office, den, teenagers room or even a foyer. Greet those who enter with words that reflect what you believe in and who you are. Best of all, you can teach without speaking. Those who enter your space won't be left guessing about what you believe in or what you're motivated by. Whether we speak words of goodness or just display them, they make an impact. So the next time you're looking for an original gift, think about giving an inspirational carpet .... they don't fly, but they can help spread words of love, which can help the spirit fly, so in that sense, they're magic. Put love on the floor to complete your décor. Very nice, Barbara. I didn't even know these inspirational rugs were available. You always find the most interesting decor items. I do love the idea of letting the inspirational rug speak for you. I couldn't help but think how cool they would be in a dorm room. Love the idea of using an inspirational rug in a Sunday school classroom, especially where tweens and teens often end up making themselves comfortable on the floor for class discussions. Great idea for a dorm room, too. Creative and so very positive. Love it! I like Susan's idea and Cynthia's. The top rug is pretty and inspirational, but I'd feel funny walking on it. I'd still be more inclined to hang it on a wall.